Nixon, of course, like almost every historical figure, has long since succumbed to caricature. He’s the “bad president”. We now know that – despite his claims to the contrary – Nixon was a crook. More than that, he’s been cast in the role of The Crook. And while I won’t add my voice to those revisionists who seek to rehabilitate Richard Nixon, I find his demonisation to be a tad curious. Because what truly differentiates him from the rest is the fact that he got caught. And yet we’re expected to believe that he really was the one bad apple, without whom the list of US Commanders in Chief would smell sweet as an orchard at the end of summer. It has been said that “history is political”. It’s a statement I agree with only up to a point, though I will concede that political history is generally political. Which is why we should be very careful about taking received wisdom at face value. There’s a tendency – and it’s a natural one – to simplify historical narratives; to make them more like fiction and less like life; to avoid complexity and ambiguity and spin history out into a fable with good guys and bad guys and easy lessons to be learnt. We view the past through a lens rooted in the present and force it to fit a cultural agenda of which we are only dimly aware, if at all. In the United States of America, that cultural agenda is still tainted by the long-discredited doctrine of Manifest Destiny. It’s buried deep and is largely unconscious, but the sense that the USA is a beacon of righteousness still lingers in the collective psyche of the nation. As such, on that level of collective unconsciousness, the Office of President is viewed as the domain of Great Men. Sure, there have been good presidents and bad presidents, but they were all Great Men elevated to the highest office by that Greatness. All except Nixon… he became the exception that proved the rule; the one craven crook to slip into the oval office. A cautionary tale. Except it’s not true. As any half-rational examination of the facts will quickly illustrate. Not that he wasn’t a craven crook. Of that we can be certain. Simply that he was far from the only one. Nixon came to national prominence as Eisenhower’s Vice President and was considered the clear favourite to succeed Ike. But in the end he was pipped to the post by a youthful and charismatic JFK in an election campaign that was, for the first time, mostly conducted on television. Kennedy – the darling of liberal America – has since been cast as the antithesis of all that Nixon represents. The Hero to Nixon’s Villain. Yet the closer one examines the presidency of John F. Kennedy, the more one realises just how far from reality the myth has strayed (even to the point where that term of office is dubbed “Camelot”). When you strip away the film-star looks, the cocktail parties, Marilyn’s rendition of Happy Birthday and the wonderfully idealistic speeches, you find they conceal a murky underbelly. You find an administration willing to risk global nuclear war rather than lose face; an administration whose policy on Cuba was founded on murder and treachery; an administration that fell far far short of the high standards it publicly set for itself. One of the interesting things about the Watergate debacle, however, is how close it came to revealing this general truth to the American people. It shook the faith of a nation, not only the faith in a single president, but also in The Presidency itself. A nation already reeling from the trauma of Vietnam suddenly found itself being kicked while it was down. Kicked by the very guy who was supposed to keep it safe. 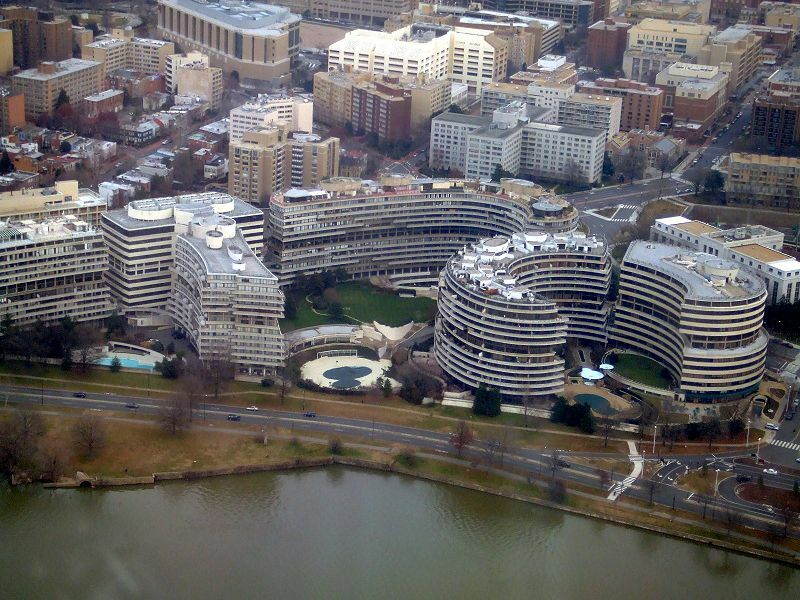 Remarkably, despite being one of the most well-documented events in recent history, the actual Watergate burglary which we commemorate here is still considered something of a mystery and the exact motive behind it remains cloudy. What we do know is that five members of a covert unit established by Nixon were arrested breaking into the offices of the Democratic Party (possibly to plant listening devices, possibly to steal files). The unit had been set up a year and a half earlier as a response to Daniel Ellsberg’s leaking of The Pentagon Papers and was tasked with the mission of discrediting Ellsberg and preventing any further leaks. For this reason, the unit was known informally as The Plumbers and was made up of ex-CIA agents, gun-runners and other shady characters; many of whom had been involved with Kennedy’s Cuban misadventures and other questionable missions for the US government during the 1960s. To the ordinary guy, all this is a bunch of gobbledygook. But out of the gobbledygook comes a very clear thing… It shows that people do things the president wants to do even though it’s wrong, and the president can be wrong. In the end, The Plumbers neither silenced nor discredited Ellsberg. Indeed, the more one reads about Nixon’s Plumbers the more like The Keystone Cops they appear. Thuggish, violent and with colourful pasts, certainly, but also essentially incompetent. And it was this incompetence that most characterised Nixon’s amazing fall from grace. From the president’s fondness for tape-recording his own criminality to the Watergate break-in that would later reveal that criminality… a break-in which offered no obvious gain to a politician who was clearly going to be re-elected by a landslide later that year. Nixon’s only serious opponent in his race for re-election was George Wallace, a conservative Democrat who looked like he might steal some of the Republican vote. But Wallace had been paralysed by a would-be assassin a month before the Watergate break-in and was no longer a viable candidate for the ’72 election. They charged us with the task: “Come up with ways of stopping Anderson…” We examined all of the alternatives and very quickly came to the conclusion that the only way you’re going to be able to stop him is to kill him… And that was the recommendation. Never was that axiom demonstrated more clearly than by Richard M. Nixon. In the months that followed the arrest of the Watergate burglars, evidence began to emerge that many of them had clear financial ties to the Committee to Re-elect the President (CRP). Tens of thousands of dollars worth of political donations to Nixon’s campaign had somehow found itself in the hands of these criminals and the further the authorities (and famously, Woodward and Bernstein of the Washington Post) probed, the closer that trail of cash and conspiracy got to the White House. It was a scandal that gripped the nation for two full years as the evidence of corruption and abuse of power slowly came to light and was drip-fed to the world by the media. Eventually the seven members of The Plumbers (the five burglars plus Liddy and E. Howard Hunt) were charged and imprisoned. By March 1974, seven members of Nixon’s staff were indicted by a grand jury… including John Mitchell, the US Attorney General, Bob Haldeman, Nixon’s Chief of Staff and right-hand man, John Ehlrichman, Nixon’s assistant in charge of domestic affairs and Charles Colson, aide in charge of political affairs. Mitchell, Haldeman, Ehlrichman and Colson all served prison terms though the other three who were indicted were acquitted or had the charges dropped. The grand jury also named President Nixon as an “unindicted co-conspirator” but was unable to bring charges against a sitting president. Soon after Haldeman and the others were convicted, it became clear that Nixon would face impeachment. Not only had he caught himself on tape ordering a cover-up of the Watergate burglary, but he was also involved in the financial irregularities that saw political donations end up in the pockets of an unofficial covert unit carrying out a variety of illegal acts in the president’s name. Incontrovertible proof that he had deliberately obstructed justice was in the public domain and for all his obfuscation and denial, it was only a matter of time before he was impeached, indicted and imprisoned. Though of course, Nixon was never impeached. He wasn’t indicted. And he certainly never went to prison. History may have cast him in the role of The Crook, but it never expected him to atone for his crimes. Instead, the man they called Tricky Dicky pulled off his final dirty trick. Cutting a deal with his Vice-President Gerald Ford, Nixon resigned the presidency before he could be impeached and in return Ford issued a full presidential pardon. It was far from a just end to Nixon’s presidency, but who could argue that it wasn’t a characteristic one? In truth it’s more than a little strange that an incompetent burglary on this day in 1972 brought down a president. The Oval Office Tapes contain presidential orders to carpet bomb foreign countries, to illegally expand a disastrous war into neighbouring states, to kill and maim on a massive scale. Yet it was Nixon’s order to cover up a pointless break-in that brought him down. And that is probably the lasting legacy of Watergate (aside from the annoying tendency of tabloids to suffix every new scandal with a “-gate”, as though Nixon’s downfall had something to do with “water”)… the clear and unambiguous message to the world that the United States does not see itself as accountable for the horrors unleashed by its own foreign policy.